Settled elegantly on the verge of the emerald ocean – Dubai Marina is the symbol of pure exquisiteness and a real gem in the crown of this spectacular city. Dubai Marina is one of the most luxurious and the largest waterfront communities across the globe whose every bit is an insignia of extravagance, exoticness, glamour and superfluity. Situated in the heart of the city with contiguity to the beautiful Jumeirah Beach, it portrays the best of amenities, attractions for the residents, visitors and tourists. There are plenty of things to do in Dubai Marina as well. Ranging from deluxe designer accommodations to modern architectures and from shimmering panoramas of water crystals to luxurious yacht canters, posh lounges, classy restaurant, etc. Dubai Marina has a bounty of lures and allures to lookout and admire. Dubai Marina is utterly famous for its celestial bars that offers the ultimate pleasure. It is completely vindicated to say that Dubai Marina is a pommel of trendy, stylish and affluent bars which offer the best of delight and niceties. These exclusive and refined Dubai Marina bars are among the elects and creams that one can’t afford to miss for sure. 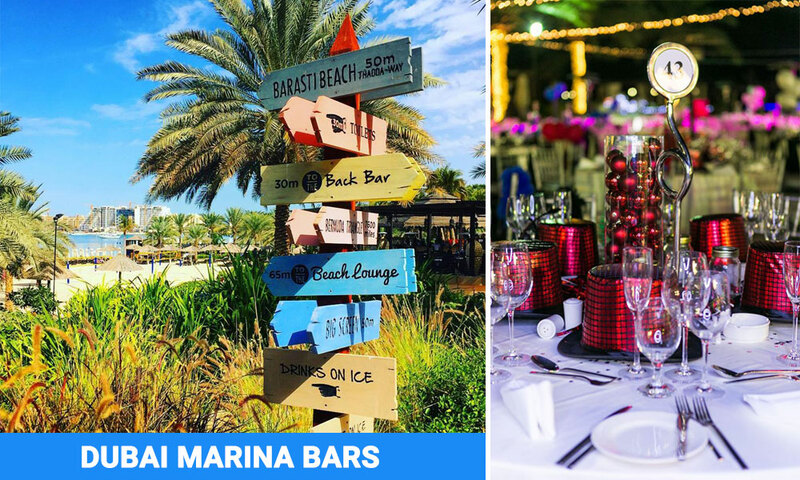 Therefore, to ensure that you don’t forego these entrancing Dubai Marina bars; here listed are the best five bars located in Dubai Marina, which will surely offer you the maximum excitement and pleasure, great food and an excellent selection of drinks. If you want to enjoy the best views of Dubai Marina with magnified beauty, then nothing could replace Barasti. The Barasti is one of the finest bars in Dubai, which allow you to look up in the amazement and wonder at the high rise towers and buildings and obviously at the tranquil beauty that is offered by the surrounding ocean. It is also one of the finest sports bar in Dubai. The bar offers great eating options ranging from international cuisines to snacks. It also serves the finest selection of cocktails and enthralling drinks that recharge your insight out. The beach side and pool side seating also serve for smoking and Shisha in Dubai. It is located at the Le Méridien, Mina Seyahi Beach Resort & Marina, Al Sufouh Road. Sink into the dark corners of Buddha Bar to enjoy the finest cocktails of Dubai in its distinctive Marina panache. Tucked away in the glamorous Grosvenor Hotel, Buddha Bar welcomes the most incisive drinkers. This Dubai Marina bar offers you an absolute night fun in Dubai on the rooftop to enjoy power driven cocktails and chilled-out music track by live DJ. It has one of the most famous Japanese cookhouse with exquisite dining configurations and delectable food. With amazing food and drinking options, Buddha Bar is a true sensation. Buddha Bar is located on the Grosvenor House Dubai – Al Sufouh Rd. – Dubai. The clandestine of the Jetty Lounge is its tenor and ambiance. Some way or another it easily consolidates the vibe of a modern chic bar with a sort of relaxing mood you would find at a shoreline hangout – which is precisely what it is. Relaxed tunes, twinkly tallow candles and comfy hassocks make this spot shout style. Discreetly. Attached to the beach, this place is truly outlandish with amazing range of cocktails, alcoholic drinks, live cooking stations and DJ and loads and loads of fun. To enjoy the sophisticated beach side bar fun with ample outdoor and indoor seating, remarkable scenery and high-end noshes; Jetty Lounge is utterly recommended. It is located at One & Only Royal Mirage, Jumeirah Beach – Al Sufouh Road, Opposite Dubai Media City. Situated in the sophisticated Grosvenor House Hotel, Siddhartha Lounge highlights a bar, lounge and eatery, which opens up from inside to an encompassing pool and terrace. The sophisticated open air venue offers guests the choice of cushioned seats and tables on layered steps, perfect for unwinding with beverages and apposite for the tapas presents on the menu. Imbuing Mediterranean and Asian seasons, the menu highlights everything from meat chorizo and pasta dishes to tartars, zesty tofu tapas and flame broils. The venue is chic and vogue has a relaxed and romantic vibe at an evening with the expansion of faintly lit lanterns and candles. The service is immaculate and cordial, and in spite of the fact that the costs are somewhat above normal for bar snacks, the general experience is one of extravagance. Located on the 35th Level of the Hilton Dubai – The Walk Hotel, Pure Sky Lounge is an absolute chilled out terrace, bar and lounge in Dubai Marina. It is one of the finest rooftop bars in Dubai, that offer amazing view of Dubai skyline, city lights and the spectacular picturesque vistas of the Arabian Gulf and Palm Jumeirah. The outdoor seating is simple with minimalist settings of tables and sofas draped with light blue and white theme, giving a laid back, cool and beachy feel to the place. The venue is super lively on weekend with great food and drink deals. The Pure Sky Lounge is worthy stopover and it is located at Level 35 of Hilton Dubai, The Walk, Dubai Marina. These the five most recommended Dubai Marina bars, though there is a lot more. If you want to recommend a bar in Dubai Marina, please do so by adding comments below.